We are listening to the recordings made in celebration of the renowned record label Deutsche Grammophon's 120th anniversary. On January 1st 2019, the digital version of the recording of the concert from the 5th of December 2018 performed by violinist Anne Sophie Mutter, the Saito Kinen Orchestra and conductors Seiji Ozawa and Diego Matheuz was released. A gala concert performed in front of the Japanese royal family, Deutsche Grammophon's tribute to a very important Asian market for classical music - Japan. It was the first time Anne Sophie Mutter performed with the Saito Kinen Orchestra, founded by Seiji in 1984 and consisting mainly of Japanese musicians, along with artists of other nationalities, all of them also members of renowned American and European orchestras. However, the story of Anne Sophie Mutter and the legendary Seiji Ozawa started before 1984. In an interview from 2010, after being asked if there are cases in which the conductor is more important than the soloist and decides everything by himself without giving the soloist a chance to interfere, Seiji Ozawa told Haruki Murakami: "It's possible. For example, the violinist Anne Sophie Mutter. Master Karajan discovered her and immediately had her record concertos by Mozart and Beethoven. If you listen to them, you can tell that it is, overwhelmingly, Karajan's world. Then they thought they should try another conductor, and I was chosen. So we recorded the Spanish Symphony by Lalo together. She was only 14 or 15 years old." 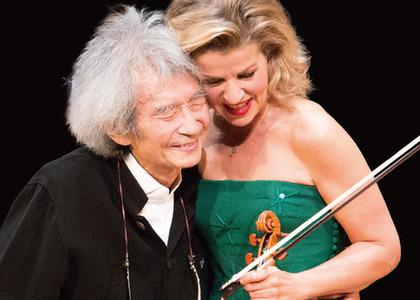 Seiji Ozawa and Anne Sophie Mutter later made three more recordings together. On December 5th 2018, they performed Introduction and Rondo Capriccioso by Camille Saint Saens, a very free-flowing and rhapsodic interpretation, as you will hear in the violinist's recording. From my point of view, though, the best was yet to come in this special concert: Tchaikovsky's Symphony No. 5, performed by the Saito Kinen Orchestra and a Venezuelan conductor - a novel combination, unexpected, even. The Saito Kinen Orchestra is a project ensemble; the musicians usually come together once a year at the Saito Kinen Festival in Matsumoto. Even under these conditions, the orchestra, led by Seiji Ozawa, ranked as one of the best 20 orchestras in the world, which is a great achievement for an Asian orchestra. The string section is very prominent in this orchestra, which allows for a repertoire with a long main melodic line, as is the case in Tchaikovsky's Symphony No. 5. The Japanese precision blends well with the warmth and impetuosity of the 34-year-old Venezuelan conductor, Diego Matheuz, who is currently the main conductor of the Simon Bolivar Symphonic Orchestra in Venezuela. Similar to Gustavo Dudamel, Diego Matheuz studied under El Sistema, the musical education system founded by Jose Antonio Abreu; at 27, Matheuz became the main conductor at the La Fenice Theatre in Venice, where he worked for four years. Now he is part of one of the most important orchestras in the world, captivating the public with his fresh spirit and the passion he shares with the musicians and the audience. Therefore, the Saito Kinen Orchestra's version of Tchaikovsky's Symphony No. 5 under Diego Matheuz's baton could only be a successful bet. On the same album, we find other recordings with the Saito Kinen Orchestra and Diego Matheuz: The Polonaise by Tchaikovsky from the Eugene Onegin opera, Beethoven's Romance for Violin and Orchestra No. 1, with Anne Sophie Mutter as soloist.